These examples have reciprocal correction where Black’s rook is the star performer. The mechanism of No.1 is well-known, but that Black knight may provide a fair chance for originality. 1.Qc3! (2.Qe3) provokes 1…R-file/Re5 2.Q(x)e5# and 1…R-rank/Rd4 2.Q(x)d4#. The other defender contributes 1…Sc4 2.Qf3#. Some useful changed play occurs in No.2. 1.Be6? (zz) garners 1…R-file/Rg4 2.B(x)g4# and 1…Rxh4 2.Qd5#, but 1…Rf5! Actually, 1.Qh3! (zz) substitutes 1…R-file/Rg4 2.Q(x)g4# and 1…Rxh4 2.Qf5#. The remaining 1…R-rank/Rf7+ falls to 2.B(x)g6#. Obviously, White’s knight must start for No.3. However, the logical 1.Sf7? 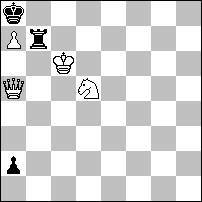 (2.Qd8#) gets denied 1…Rb6+! More exact is 1.Sc8! (zz) which promptly dispatches 1…R-rank/Re7 2.Qxe7# and 1…R-file/Rb6+ 2.S(x)b6#. 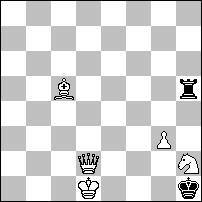 One last desperate 1…Re8 brings 2.Qd6#. Two nice peripheral offshoots are drawn from No.4. 1.Bc7! (zz) organizes the expected 1…R-file/Rd8 2.Q(x)d8# and 1…R-rank/Re6 2.Q(x)e6#. Bonus frills are 1…B~ 2.S(x)b6# and 1…Bxc7 2.Qxc7#. The key of No.5 must insert a blocking move, else 1.Sf1? (zz) permits 1…Rh4! Hence, 1.Sg4! 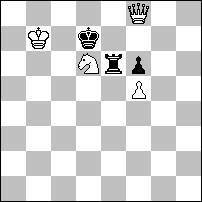 (zz) suitably condemns that hapless rook to 1…R-file/Rd5 2.Q(x)d5# and 1…R-rank/Rh2 2.Q(x)h2#. There are abundant tries and virtual activity in the beguiling No.6. A waiting gesture like 1.Kf4? (zz) gives 1…Re1 2.Rxe1#, but 1…Kxf1! 1.Kg3? 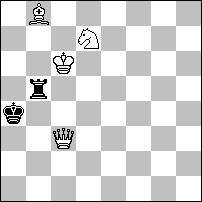 (zz) advances with 1…Kxf1 2.Qd3#, but 1…Rc3+! 1.Sd2? (2.Qe3#) transfers 2.Re1# for 1…Rc3, but 1…Rxf1! 1.Rd1? (2.Qd2, Sxc1#) gets refuted 1…Rxd1! 1.Rg1? (2.Qd2, Qe3, Sxc1#) is no better due to 1…Rxg1+! 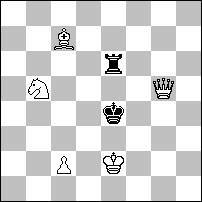 The solution turns on 1.Bg1! (zz). The customary formula follows after 1…R-rank/Rc4 2.Q(x)c4# or 1…R-file/Rd1 2.Q(x)d1#. Then comes the best part. 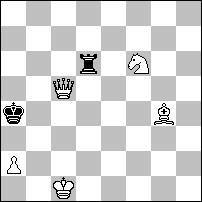 Three “elimination” tactics attend 1…Re1 2.Rf2#, 1…Rxf1 2.Qd2#, and 1…Kxf1 2.Qf2#. Altogether there are nine assorted mates. 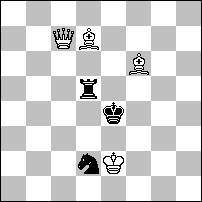 No.7 has the Black King’s sole guardian placed at an outlying position. The reckless 1.Qc4+? catches 1…Ka3 2.Qb3#, but 1…Ka5! 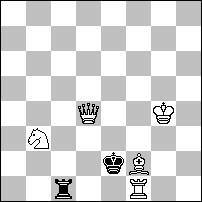 1.Bd7+? 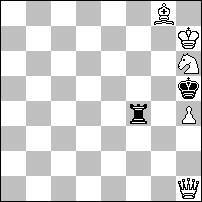 destroys 1…Rc6 2.Bxc6#, but 1…Rxd7! 1.Sd5? 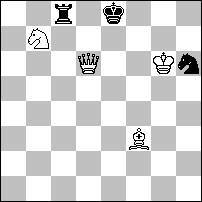 (2.Qb4, Sc3, Bd1#) is also captured 1…Rxd5! A more discreet 1.Se4? (2.Sc3#) is met 1…Rd3! Ultimately, 1.Sd7! (zz) does the trick. 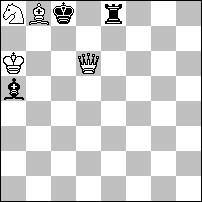 Now the besieged castle must glumly surrender to 1…R-rank/Rd1+ 2.B(x)d1#, 1…R-file/Rb6 2.S(x)b6#, and 1…Rxd7 2.Bxd7#. Everything seems to be already set for No.8. 2.Qd8# pounces in the event of 1…Rxa7. Nonetheless, something must be done about 1…a1Q! 1.Qxa2? proves no help because 1…Rxa7! becomes playable. So, 1.Qa6! (2.Qxb7#) applies a critical threat which alters 1…Rxa7 to 2.Qc8#. The rest is apparent: 1…R-rank/Rb6+ 2.S(x)b6# and 1…R-file/Rc7+ 2.S(x)c7#. One optimistic try accompanies No.9. 1.Bf7? zooms off hoping for 1…Sf1 2.Bh5#, but 1…Sg4! Of course, the patient 1.Be6! (zz) adroitly settles the issue. Results are 1…R-rank/Rd5 2.B(x)d5#, 1…R-file/Re3 2.R(x)e3#, and 1…S~ 2.B(x)g4#. Another errant bishop try is featured in No.10. 1.Bh5? (2.Kxh6#) is obstructed by 1…Sf7! Once again, a meticulous waiter carries the day. 1.Bd5! (zz) calmly anticipates 1…R-rank/Rc6 2.B(x)c6#, 1…R-file/Rd8 2.Q(x)d8#, and 1…S~ 2.B(x)f7#. Two passable tries augment No.11. 1.Qc4+? fetches 1…Rb4 2.Qa2# or 1…Ka5 2.Qxb5#, but 1…Ka3! 1.Bd6? (2.Qa3#) produces 1…Rb4 2.Qxb4#, but 1…Rb3! holds. As usual, the quiet pause 1.Bc7! (zz) scores. Derivatives are 1…R-rank/Rb6+ 2.S(x)b6#, 1…R-file/Rc5+ 2.S(x)c5#, and 1…Rb3 2.Qa5#. In No.12, 1…Rd6! is a constant nemesis that copes with 1.Qc5? (2.Sc3#), 1.Qh5? (2.Qf3#), or 1.c4? 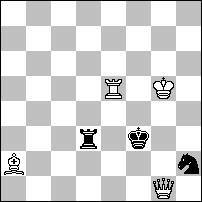 (2.Qd5, Qg4, Qf4#). The innocent 1.c3! (zz) puts the boot to 1…R-rank/Re5 2.Q(x)e5# and 1…R-file/Rd6 2.S(x)d6#.